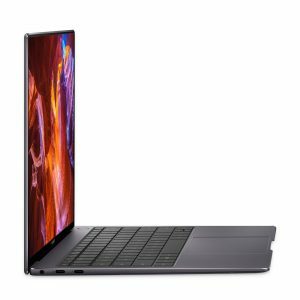 Huawei MateBook X Pro (Mach-W19B) is the latest 2018 release 13.9” slim and lightweight “MacBook alternative” laptop with pretty much the similar features and design at a 30-40% lower price. This is a “Signature Edition” laptop without any junkware that will slow the system down but with the Office 365 installed. It is a very popular unit with great features that manages to score 4.9/5 stars at the time of this review. Huawei has a large 13.9” ultra-thin bezel 3K touch infinity display “First FullView Display” and 91% screen to body ratio as well as the 3:2 aspect ratio. It comes with the latest eight generation ultra-low voltage Intel i5-8250U processor with up to 40% better performance than the seventh generation version, a decent 8GB DDR4 memory, a good size and fast 256GB Solid State Drive for performance and speed overall. The mystic silver MateBook X Pro looks and feels premium with a sleek metallic unibody with diamond cut edges, weighs only 2.93 pounds and measures 11.97 x 0.57 x 8.54 inches. It is designed for both home or office use and for those that are out and about a lot. The 3K touchscreen is quite special with 1500:1 contrast ratio, 3000 x 2000 pixels resolution and 260 PPI, so you have a proper home theater experience. You get to see a vibrant screen with all the details when you’re viewing the high definition content. Sound quality is also pretty good- loud and clear through the stereo speakers with the second generation Dolby Atmos. You’ll get to the main Windows Start screen in less than eight seconds by pressing the single touch power button with the optimized BIOS and doing the ID authentication via Windows Hello. Connectivity options include a VGA port, an HDMI port, a USB-C port, a USB-A port as part of the compact Huawei Mate Dock 2.0. It has a beautiful modern design and the dark grey is similar to the MacBook color. Although it is lightweight, compact, ultra-slim and portable it works just like a modern powerful and fully functional laptop. With a very large 57.4 Wh battery, you can use the MateBook for up to 15 hours if you’re just browsing the internet, up to 14 hours if doing your office work and up to 12 hours for video playback. You can expect up to 9-10 hours in practice depending on what you do on the computer. In the box, you’ll find the MateBook X Pro, a two-meter-long USC C cable, a power brick and the Mate Dock 2.0. As a great unique privacy feature, this model comes with a recessed webcam that is located in the keyboard and will appear only when you want it to. It has a full-size spill-proof keyboard in case of potential spilling accidents that could destroy your keyboard. The backlit keyboard is similar to what you’ll find on Surface machines and also very comfortable to type on. The NVIDIA GeForce MX150 discrete graphics card performs better than the older GeForce GTX 950M that you may be familiar with and you can play the latest demanding games at lower resolutions and settings. You can use it outdoors comfortably as the screen is quite bright and you can play with the image and color settings if you have a problem with the display quality. You can upgrade the 256GB SSD if you want more speed or storage capacity. Huawei Pro is not a cheap laptop by any means and the build quality is not as good as the MacBooks, the location of ports could be better, the webcam is a 1MP one and does not offer the best quality image, and it gets warm and doesn’t work very quietly- you can hear the fan in a quiet room. 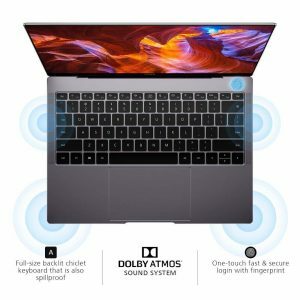 On the other hand, the keyboard is very efficient, the sound is the best you can find on any laptop, the image quality is simply superb, overall computer performance is very good and the price is much better than competitors with the similar design and features. You have the option to get the Intel i7 8550U model at a significantly higher price through the Amazon product page.